I’m willing to bet that this photo would have looked a lot better if more than 5 of these had survived the ‘taste test’, but that’s what happens if you don’t whip your phone out fast enough when these little babies are around. *blink* Gone. These are my Date & Coconut Bliss Balls – I’m still looking for a better name so open to suggestions. They’re gluten-free, dairy-free and no added sugar but 100% delicious. People always think they must contain chocolate but, sssshh, they don’t. There’s a million different bliss ball type recipes around these days but this is my personal favourite combination. It’s very simple too, not too many ingredients. They are best made with Medjool dates but my date habit was becoming a bit expensive. I now buy a 1kg box of Jordan River dates, they’re nice and soft and juicy like the Medjool, just not quite as large, and are a lot nicer than the regular ‘dried fruit aisle’ ones. Place cashews in bowl, turbo 3-4 times until they resemble a fine crumb. Add all other ingredients, Whizz 25 sec Sp 10. Roll into evenly sized balls and roll in extra coconut. You can also roll them in cocoa but I do love my coconut! Having recently moved to the UK I am finding that the desiccated coconut here isn’t grated as finely as what I am used to. If this is the case then it can help to give the coconut a bit of a whizz on it’s own first to make it finer. Makes for a smoother bliss ball. 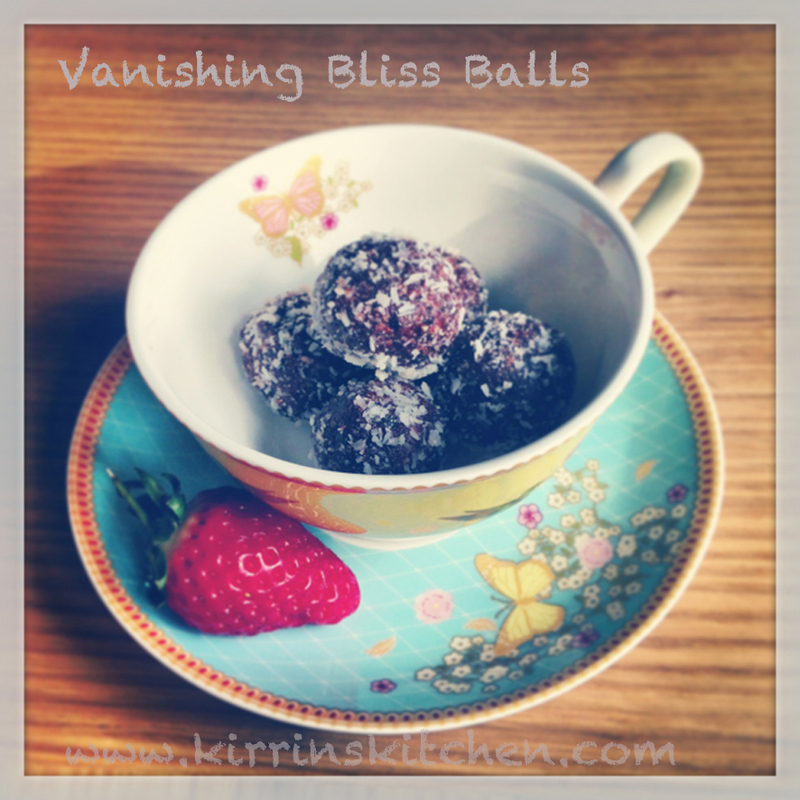 This entry was posted in Kirrin's Kitchen, Recipes, Treats & Snacks and tagged bliss balls, chocolate, coconut, dairy free, dates, gluten free, grain free, recipe. Bookmark the permalink. « Three C’s Pizza Base – Oh Em Gee! Have only got around to making these…..yummy and so easy. Thanks Kirrin.